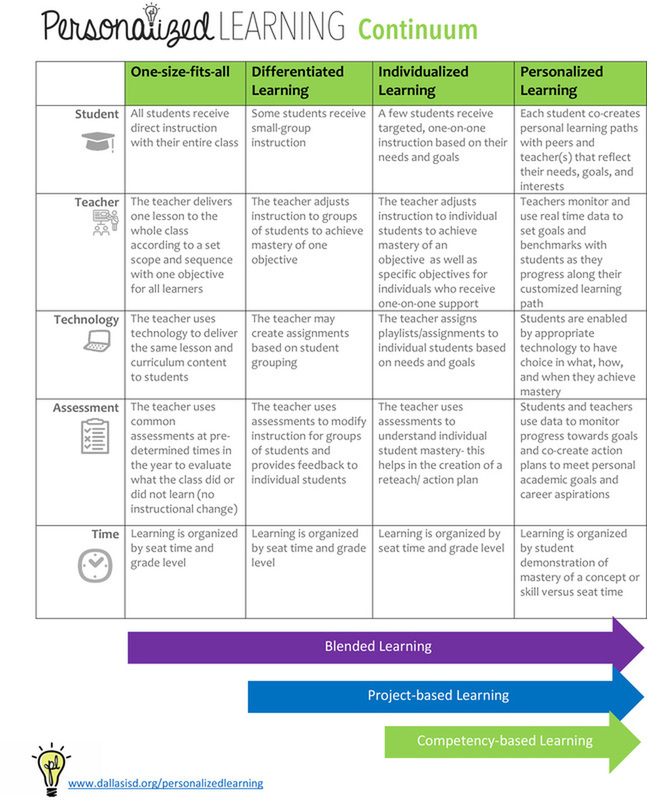 Personalized Learning (PL) is a one-size-fits-one approach to instruction that (1) taps into each student's strengths, needs, and interests to customize learning and (2) supports student voice and choice in what, how, when, and where they learn to ensure that all students achieve at their greatest potential. Students demonstrate learning through authentic, rigorous, and relevant assessment and engage in frequent feedback cycles in order to improve. Data drives instructional decision-making. Students engage in rigorous, standards-aligned content at their unique zone of proximal development. Content is accessed through authentic, rigorous, and relevant learning experiences. Students operate in the context of a learning environment that nurtures a growth mindset, a sense of belonging, and student-led accountability. Students actively exercise voice and choice in the classroom through personal goal-setting, reflection, and instructional decision-making (as appropriate). Used to tell a student’s academic and personal story. A learner profile includes a student's strengths, areas of growth, interests, aspirations, and how he learns best. A student's profile should empower him to own his learning and advocate for what he needs in order to be successful. Customized roadmaps for all students to help them reach their academic destination. A personal learning path describes how a student will master a concept or skill - what lessons and activities she will engage in to become an expert in rigorous content. Allows students to have voice and choice in when, where, and how they learn. Depending on the student, a student may learn in a big group, small group, or by himself - sometimes all in one day. Learning spaces aren't just at school: with the help of technology, students can learn anytime and anywhere. Allow students to learn at their own pace. When a student demonstrates she has mastered a concept or skill, she can move on to the next one. Teachers work closely with students to understand what they've already mastered and what’s coming up next so that students know exactly how they are progressing through content. Mastery means that a student is an expert. If she doesn't have complete command of a concept or skill, she continues to work on it.